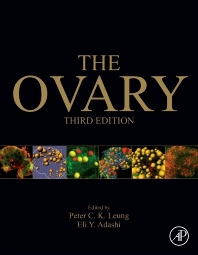 The Ovary, Third Edition, includes more than 60% new material that highlights the clinical aspects of human ovarian functions. It covers advances in the areas of genomics, assisted reproductive technology, and cancer diagnosis and treatment. This updated edition synthesizes new information at the molecular, cellular and organismal levels, while also presenting modern ovarian physiology in a more understandable and comparative context. The book looks at ovarian function from a detailed molecular and cellular level that examines all phases of the ovarian lifecycle that places special emphasis on the pathophysiology of the human ovary, including ovarian carcinogenesis. Dr. Leung is a Professor at the University of British Columbia’s Department of Obstetrics & Gynecology and former Associate Dean in the Faculty of Medicine at UBC. Dr. Leung received his PhD from Western University. After post-doctoral training at the University of California at Los Angeles and the Laval University, he joined the University of British Columbia in 1982 as a faculty member. Dr. Leung has received a number of prestigious awards, including a Scholar Award and a Scientist Award from the Medical Research Council of Canada, a Distinguished Scholar Award from the Michael Smith Foundation for Health Research and a Senior Scientist Award from the BC Children Hospital Research Institute. Dr. Leung has served on many national and international organizations, including as President of the Canadian Fertility and Andrology Society, Director of the Society for the Study of Reproduction, Director of the Ovarian Workshops in the USA, temporary advisor to the World Health Organization, Fellow of the Canadian Academy for Health Sciences, and Fellow of the Royal Society of Canada. Dr. Leung’s research focuses on hormonal determinants of women’s reproductive health. His publication record to date includes 400 papers, 350 abstracts, 22 book chapters and 7 monographs. Since his appointment at UBC, Dr. Leung has served as the research supervisor for more than 100 graduate students, postdoctoral fellows and visiting scientists. The former Dean of Medicine and Biological Sciences at Brown University (during its 2007 renaming in honor of Mr. Warren Alpert), Dr. Adashi is an academic physician-executive, a graduate of the Harvard T.H. Chan School of Public Health program in Health Care Management (MS, 2005), and the former president of the Society for Reproductive Endocrinologists (SRE), the Society for Gynecologic Investigation (SGI), and the American Gynecological and Obstetrical Society(AGOS). Dr. Adashi received his medical degree in 1973 from the Sackler School of Medicine, completed residency training in Obstetrics and Gynecology at Tufts University (1974-77), and pursued fellowship training in the subspecialty of Reproductive Endocrinology and postdoctoral training in reproductive biology at Johns Hopkins University and at the University of California at San Diego, respectively (1977-81). Faculty positions were held at the University of Maryland (1981-1996), the University of Utah (1996-2004), and Brown University (2004-present). Prior to joining Brown University, Dr. Adashi served as the John A. Dixon Endowed Presidential Professor and Chair of the Department of Obstetrics and Gynecology at the University of Utah Health Sciences Center (1996-2004) and the founder and leader of the Ovarian Cancer Program of the Huntsman Cancer Research Institute (1999-2004). Dr. Adashi has been the recipient of continuous National Institute of Health (NIH) funding from 1985 to 2005 inclusive of a Research Career Development Award. Mentor to over 50 postdoctoral trainees, and the author or co-author of close to 400 peer-reviewed publications and over 120 book chapters/reviews, Dr. Adashi co-edited or edited 16 books in the general area of reproductive medicine with special emphasis on ovarian biology. Dr. Adashi 's work has also seen press with the New York Times, the Washington Post, the Boston Globe, the Huffington Post and several other media venues. NIH service included but was not limited to membership with the National Council of the National Institute of Child health and Human Development (NICHD)(1997-2001), the Reproductive Endocrinology Study Section (1988-1992), and the Selection Committee of the Reproductive Scientist Development Program (RSDP)(1988-2005). Dr. Adashi is the former Editor-In-Chief of Seminars in Reproductive Medicine and the former Associate Editor of Endocrinology, Journal of the Society for Gynecologic Investigation, Reproductive Medicine Review, Seminars in Reproductive Endocrinology, Reproductive Medicine Review, and Reviews in Endocrine and Metabolic Disorders. A former Franklin fellow and Senior Advisor on Global Women's Health to the Secretary of State Office of Global Women's Issues (1st term of the Obama Administration), Dr. Adashi is a member of the Advisory Council of The Hastings Center, Board of Governors of Tel Aviv University, and chair of the Medical Executive Committee and the Medical Advisory Council of the Jones Foundation for Reproductive Medicine. Dr. Adashi is a former member of the Board of Directors of Physicians for Human Rights, the Council on Foreign Relations, the Global Agenda Council on Population Growth of the World Economic Forum, and the Medicare Evidence Development & Coverage Advisory Committee (MEDCAC) of the Centers for Medicare & Medicaid Services (CMS). In addition, Dr. Adashi is a former advisor to the National Committee for Quality Assurance (NCQA), the WHO, the World Bank, the Rockefeller Foundation, and the Bill and Melinda Gates Foundation. A former Examiner and Director of the Division of Reproductive Endocrinology of the American Board of Obstetrics and Gynecology (ABOG), Dr. Adashi has served as President of the Society for Reproductive Endocrinologists (SRE), the Society for Gynecologic Investigation (SGI), and the American Gynecological and Obstetrical Society (AGOS). Elected to the NAM in 1999, Dr. Adashi has served as a member of the committees on Antiprogestins: Assessing the Science (1993), Understanding Premature Birth and Assuring Health Outcomes (2005-2006), Human Embryonic Stem Cell Research (2006-2009), and on Women's Health Research (2008-2012). In addition, Dr. Adashi served as co-chair of the Committee on Reducing Childbirth Mortality in Indonesia (2012-2013). Finally, Dr. Adashi has served both as a reviewer and a review coordinator for multiple IOM reports and as chair of the Maternal & Child Health and Human Development (IG-07) interest group (2009-2011). Dr. Adashi also served twice as a member of the Board on Health Sciences Policy. As a tenured Professor of Medical Science at Brown University, Dr. Adashi is a member of the Brown Center for Prisoner Health and Human Rights and co-directs the Healthcare in America course (a highly subscribed medical school elective) and the Healthcare Policy Concentration (a medical school elective for students with special interest in Healthcare Policy).